A gorgeous watercolor reminder that your love is written in the stars! What a lovely way to show the one you care about just how special they are to you. Just specify the birth months with your order and they will customize it and handle the rest. 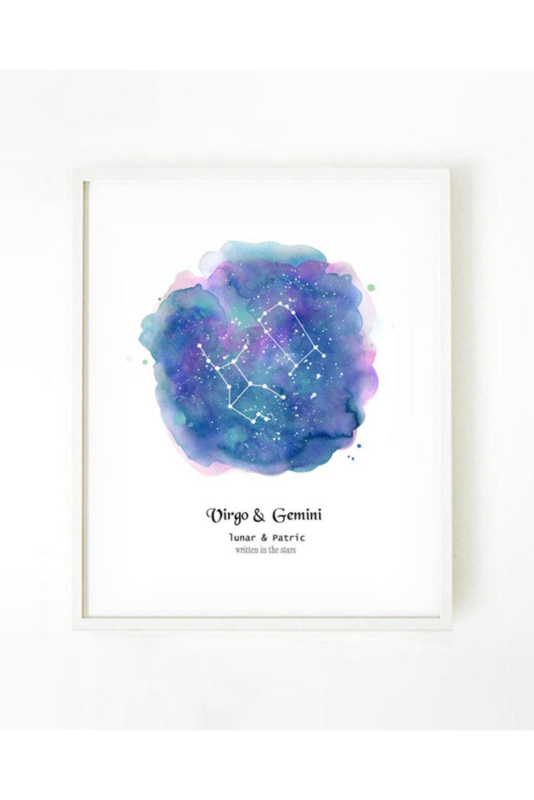 Couples Constellation Print by 324 Art, $11.50. Image via 324 Art. If your sweetie (or you) lives for the finer things in life, you can't go wrong with these luxurious sheepskin slippers from Mahi Leather. Mahi Leather specializes in affordable leather goods that benefit a great cause! Sheepskin Slippers by Mahi Leather, $101. Image via Mahi Leather. For the sentimental person in your life what could be greater than giving them a personalized poem from Eternal Poetry? Priced per line, these poems by Massey Armistead are written specifically for you about anything you want! What could be more thoughtful? Personalized Poem by Eternal Poems, $50 for 10 Line Poem. Image via Eternal Poetry. For the lover of all things handmade you can't go wrong with this beautiful letterpress card from Anna Brown Creative Studio. This beautiful gratitude print comes with an envelope for sending in the mail, but is also meant to be displayed after the fact in a frame. That's a gift with double the bang for your buck! Frameable letterpress greeting card by Anna Brown Creative Studio, $7.50. Image via Anna Brown Creative. They say diamonds are a girl's best friend, but diamonds are expensive! The next best thing? How about a piece of raw gemstone jewelry from DaniBarbe. These raw emerald rings are a show stopper!